Congratulations to Ms. Leiana S.A. Naholowa’a who has compiled a beautiful film on Chamorro mothering and has a packed house in the UOG CLASS Lecture Hall — probably over 200 in attendance. Ms. Naholowa’a is now introducing her project. 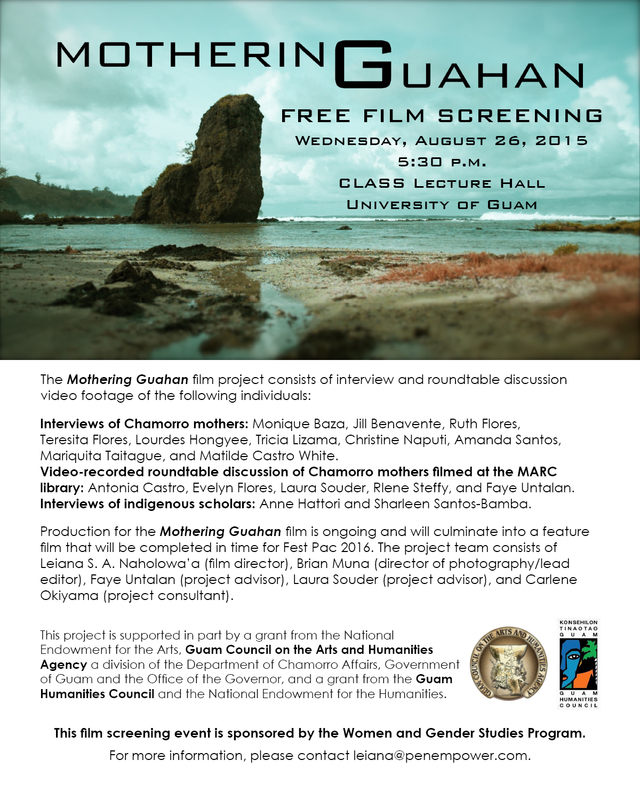 The film is tied to her master’s thesis research with the Division of English and Applied Linguistics at the University of Guam on the role of mothering in Chamorro literature. She is also introducing Brian Muña, a wonderful local director (Madam) who helped her make the film. Mr. Muña is a new Chamorro father. 🙂 Mr. Muña is celebrating the men in the audience who have come out to support the film as well and saying, “Every man should watch this film.” He is a counselor and works with many male clients who do not forget the strength of their mothers in their lives. Mr. Muña is saying that men and women alike will benefit from watching the film. Following the opening reception, we will be screening the film together, then hearing from a panel of Chamorro mothers including Dr. Faye Untalan, Dr. Laura Torres Souder, Juanita Blaz of Island Girl Power and the Ayuda Foundation, Ashley Cruz of Guam Moms Helping Moms and Families, and Helen Aguon, a.k.a. “Island Girl,” host on ISLA 63 AM. Teresita Flores, a Chamorro elder, opens the film. “In our culture, women are very, very strong.” “Once you become a mother, you are a mother forever.” She is speaking of the devotion and connection between a mother and children. Mothering in Chamorro culture involves a responsibility in what you are doing, from the beginning, from the first-born, for the dependent children. Ruth Flores, a lady of 90+, follows. She speaks of the strictness of Chamorro mothers: they do not repeat themselves, and she likes the strictness very much. She followed this when she was raising her own children. There’s a certain way of looking the parents use. Monique Baza, a younger Chamorro mother, speaks of being a role model, managing children and career, hard work, discipline, and respect as of major importance in conveying to the children. Honor. She has learned from her mother and grandmother, who both helped to raise her, what it is to be a Chamorro mother. Respect and family must be first and foremost. Lourdes Hongyee, an elder, was raised in a Chamorro-speaking household. Her mother did not speak to her in English. She too was a disciplinarian who would spank all the children if one was at fault. “If somebody go in trouble, everybody got in trouble.” She did not go to school, but she taught the children the roles of a housewife, to help cook and clean. Laura Torres Souder, an elder, describes the Chamorro culture as matrifocal and matrilineal. The mother is at the center. “In my own experience, Mom ruled, but not in the sense of a patriarchal ruler, or a matriarchal ruler . . . but she was the queen. She was the queen bee.” Everything was in that context, around the mother. They did what she wanted relating to observing traditions and caring for one another. The mother was the glue of the family. Even today, with the diaspora and families scattering across the globe, the mother is still the same central force, linking families back to the ancient Chamorro ways. No matter how we function in the modern context, we still retain that tradition, matrilineage, the uterine line as a very strong definition. Antonia Castro, a WW2 survivor, lost her mother when she was very young. She saw that the mother was the pillar of the family when she married and had her own children in terms of how her husband treated her as the final say for the children. Dr. Evelyn S.M. Flores, a Chamorro mother, is drawing a comparison between the Western family (patriarchal) and the Chamorro family which has two pillars (both mother and father). She believes the Chamorros were egalitarian, with the strengths of both men and women balanced, one of the few egalitarian societies ever. Jill Benavente, Master of Chamorro Culture, is speaking at Sågan Kotturan Chamoru on teaching children or any young people how to eat healthily and take care of themselves. She shares this as well with the young people who visit her. Nutrition affects the soul. A Chamorro elder, Matilde Castro White, speaks of trying to protect children, and guide them, so they will not be hurt. Sometimes children don’t learn, but if they get hurt, they will learn from that. Children should listen to the wisdom of the elders, to practice their culture. Rlene Santos Steffy is speaking of how mothers and sisters protecting the food and caring for the younger people during WW2 while men were subjugated to labor and so on. Sometimes they would not eat themselves. Maraquita Taitague spoke of the mother who teaches children to work hard. She grew up in a big family, in a poor home, and everyone had chores and responsibilities. They used an iron with charcoal inside, washed their clothes by hand, collected wood for the stove, and so on. They also had to collect water from the city in a big drum. At the same time, the mother would also say, to be honest, never to take anything that was not yours (even something thrown away). Jill Benavente returned to Guam at the age of 13, whereupon she discovered that her mother was a suruhåna and a master weaver. Her mother would cook on an outdoor stove with wood and live off the land. Ms. Benavente thought that was wonderful, pushing her to focus on natural resources. There was no need to go out and buy anything. Everything was on the land. Dr. Faye Untalan’a aunt was the center of her house. She was the manager who controlled what everyone was working on at home. So Chamorro women, as experienced in the culture, are the managers of the family. Dr. Tricia Lizama’s mother is her go-to resource for questions about Chamorro culture, where to find a caterer or a recipe for corn soup. Christine Naputi, a younger woman, has a mother who helps organize the family for events and keep everyone informed. Dr. Flores says mothers are the protectors of family and the keepers or bearers of genealogy. Her generation let go of that knowledge in the move from oral to written culture. Her own mother would always ask the cashier at the store her family and then track and track and track the family connections. Dr. Souder thought mothers defined family loyalty. Who required your loyalty. Mothers also defined the family connections and who needed to be shown respect and who was considered an elder family connection. The first question was always “Håyi nanå-mu?” — that set the social universe in action and then you knew how you needed to relate to people. Chenchule’ was always controlled by women, never men. Dr. Souder adds it is important to reinforce family obligations and connections for young people today. That responsibility of culture-bearing is now in her generation’s hands and it will be lost otherwise. In her experience, having an hour a day with all her aunts was amazing, taught of her family history, and reminded of her responsibility to carry this forward. Dr. Untalan says once families made time to be together (back in the ’50s) but many families today do not even eat together, which has eroded cultural practices and familial connections. Mothers need to step up, get the genealogy going, get the families connected. No one cared if she was college-educated. Who was her mother? Dr. Hattori says when land was controlled by clans rather than individuals, women had much more power over it. But with modernization (banks, etc. ), the land was split up and as land titles were registered, the majority went into men’s names and women began to lose their traditional control over land, a historical bedrock of women’s power. Dr. Souder says change will inevitably happen, but can be guided to create the kind of tomorrow that we desire. We need to face the idea that we are a colonized people, made dependent through our colonized experience, with social pathology resulting from a very fractured identity, the legacy of colonization and conquest. We must deal with this as a community. Until we understand how that has shaped Chamorro mothers and their self-definition, we cannot act as boldly as we must. Antonio Castro points out the division of mothers from their children because mothers are working outside the home more now. Children are not spending the majority of their time with their families. Changes in values since the 1950s are affecting the children, and the mother no longer has that close contact with her children. Ms. Baza says the physical being of parents, physically being in the home with their children, is vital to children’s well-being. Parents too often pull away as children are growing older. (Ms. Baza is a schoolteacher.) Her parents were always there and it pushed her in the right direction. Mother and father both need to be an active participant through childhood but also the teenage years when even extra guidance is needed. Children today are more affected by Westernization than their families. Dr. Untalan points to economic changes that have affected the family. Families are no longer in a communal organization. Now the individualism of Western values have eroded social, communal values of the Chamorro culture. Economic struggle, which she has seen in families, is very devastating. There is a sense of despair that is very clear. The economic system we now have to live by leaves a gap regarding skills and abilities to cope and manage. The new economy is a burden on many Chamorros. Ms. Taitague’s mother and aunts did not work in a Western sense. The mother was at home, not working outside the home. Women were more content of their livelihood. Their ambition was to bring children to the world, not to go out and work. Mortgage, paycheck, power bill — none of that. They were contented during her time with what they had, and happy with it. Those ways of living are better than what we have now, to keep up with the Joneses and with children obsessed with iPads, stopping at McDonalds and KFC for what every different child wants to eat for dinner. Tricia Lizama speaks of rosaries as the foundation of basic prayers and coping as a teenager, to have spiritual guidance in a positive light, which she wants to share with her children. We saw footage of Dr. Lizama with her family in the Santa Maria Kamalen procession. Dr. Sharleen Santos-Bamba speaks of generational dynamics. The constant is family at the heart, spirituality at the core, in terms of ways of knowing in Chamorro culture, to be literate in the culture. Sustainability of culture is dependent on intergenerational exchanges. Ms. Naputi learned resilience from her WW2-survivor grandmother who also raised eight children. She herself was a single mother for a long time and learned how to deal with it, get help, and survive. Teresita Flores speaks of the importance of grandparents passing down family stories, to tell the younger generations of what happened during times the young ones would not otherwise know. Important that Tumon used to be beautiful, with no hotels. So many trees were cut down, so much land cleared, just for hotels, and she felt so disappointed. She tells her grandchildren what Tumon used to be like, so beautiful back then. Ms. Steffy — if love is in the family, that is the most important thing. Loyalty follows from it. Love draws you home, if you are in that nucleus, if you have a good relationship with your parents. Ms. Naputi finds that the voice of her mother resonates in her head, every single day. Dr. Souder pushes back against the insidious idea that teaching Chamorro to a child is a disservice. Research shows that knowing more languages is helpful for a child. Chamorro mothers should take that on as a responsibility. For Dr. Santos-Bamba, to hear the novena songs or other prayers in Chamorro is far more powerful than in English. As a child, hearing her grandmother pray in Chamorro, meant spiritual practice and Chamorro language were deep in the heart. English was not what soothed the soul. Ms. Santos says, ” . . . Mother is a hard-working woman. I nåna, magåhet dangkolu . . . [apologies, I did not catch the rest]. You will never miss your mother till she’s gone.” A song she is remembering. The film ends! Biba Leiana! Biba Nåna! The film participants in the audience are introduced and cheered! Ms. Naholowa’a welcomes the ladies from the film who are present in the audience, including her project advisors, Dr. Untalan and Dr. Souder. The audience is now asked to fill out their evaluation forms. Dr. Souder and Dr. Untalan also come to the stage. The five ladies all gather on stage in a semicircle of chairs and couches to discuss the questions. Juanita Blaz’s mother was born and raised on Guam. She wasn’t Chamorro at all (she was Scotch-Irish-Spanish-Indian), but fought for the protection of her daughter’s culture, especially going to the Legislature to protest the digs that disturbed archaeological, ancestral remains in Tumon. She ensured her daughter knew where she came from on the Chamorro side. Running Island Girl Power is about returning to the community and teaching her own five daughters to care for the community, provide for your family, cooking with love and proper nutrition especially struck a chord. The challenges on Guam are a terrible thing that make our girls suffer — teen pregnancy, sense of loss, sexual assault, etc. The girls are getting depression at much younger ages than girls do in the mainland. “Si nåna ha simenta i familia,” says Barbara Benavente [apologies if I have transcribed the Chamorro incorrectly]. She gets the audience to repeat it after her. Dr. Untalan says we must continue to seek the true significance of the Chamorro mother. This film is so encouraging, to see the mothers we have, who continue to be the culture bearers. We will never lose our culture so long as it is embedded in the family. If the mother is Chamorro, regardless of the father, culture was always very strong, in Dr. Untalan’s research. Some fathers help promulgate their Chamorro culture, but often — too often — if the mother is not Chamorro, culture is lost or diminished in the family. Dr. Souder expresses pride in Leiana and in her grandmother and in her mother who is here working hard too behind the scenes. This family working together is the power of Chamorro women. Dr. Souder has tried to give voice to women in her work, women from the past and the present, and she is pleased to see Leiana continue to do that in this “genuine expression of Chamorro women’s voices” which is a gift Leiana is giving to the island and to our people. The women who spoke talked of their mothers, grandmothers, and all the women around them and behind them — a great multiplier effect of wisdom — “I always hear my mom’s voice in my head,” said Christine Naputi. Dr. Souder’s mother has been dead thirteen years — “but to me, she’ll never die” — because her voice is still in Dr. Souder’s head. Being a nåna is heavy-duty, worrying about school supplies, eating right, all those mundane things. It is an awesome responsibility for those at the “saina” age also. The microphone is passed to the audience. A young Chamorro man (Darrin Pangelinan) rises and says his mother always spoke of her responsibilities, with nåna stories so he could feel like he was part of something more. He heard stories while being raised in the States, but never experienced it. The film gave him the sense that he was there, too. It was very beautiful. An elder woman rises and says Chamorro language is part of what mothers/grandmothers have bequeathed: “i fino’-ta.” From ancient histories, we know Chamorro culture was passed on by the women, decided who would have land, how things were passed on, and so on. Juanita Blaz says there are many homeless mothers, we need to protect our community now. There is much family violence also. “We need to handle our issues. Let’s not turn away the women and children who are homeless anymore. Since when did we forget how to care?” She hopes that this film will remind us why we are here. Christine Naputi’s sister says it is true that the mother is the pillar of the family, who keeps it together. Moneka Flores asks the ladies to talk about the diversity in age and career among the subjects of the film, the diversity which embodies the challenges Chamorro women face today. Dr. Souder celebrates the historical Chamorro woman’s role of the storyteller. Now we must transition and transform the storytelling by writing about it and publishing the stories, for children who do not have access otherwise, to transmit the values like inafa’maolek and inafa’guaiya [?]. We must practice these things for them to survive. We must change our techniques, to adapt. She calls for established writers to be mentors to younger women. “Get over this idea that you need a Ph.D. Take it from someone who has one, you do not need it. It’s the Chamorro nåna in me that tells that story . . . [to] my granddaughter.” Her ancestors speak through her when she is telling a story to her granddaughter. Seize the power — you have it. We can’t save all our social pathologies, but strong mothers make strong families to help children become well-functioning adults in the community. Dr. Souder worked all her life. It’s part of our new reality. You do not need to stay home — share with the community. Leiana thanks the audience and the event concludes. 7:36 p.m.
Maolek na puenge, todus hamyo. I hope this is comprehensible. We are excited to be able to share the evening with those of you who could not attend in person. Tags: Chamorro, documentary, film, guåhan, interviews, leiana naholowa'a, liveblogging, mothering guåhan, mothers, university of guam, uog, women and gender studies. Bookmark the permalink. Biba! Gof maolek na un “liveblog” este! Triste yu’ na taigue yu’ ya ti hu egga’ i mubi.